27 MEN 10 NATIONS ONE SPIRIT. 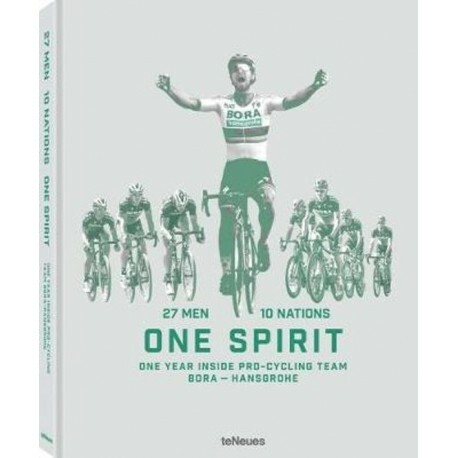 ONE YEAR INSIDE PRO-CYCLING TEAM BORA- HANSGROHE. !!!! SLECHTS 6 EXEMPLAREN OP VOORRAAD. UITVERKOCHT BIJ DE UITGEVER. Drietalig: Duits, Engels en Frans. 25,5 x 32,5 cm. Harde kaft. BORA - hansgrohe is one of the world's most successful professional cycling teams. 27 Men 10 Nations one Spirit provides a fascinating behind-the-scenes look at the German team. What makes the riders tick, and who plays what role? How does the team behind the team work? How did the races go during the exciting 2018 season? Powerful images make this book a thrilling tour-not just for cycling fans. There are few sports as accessible as cycling. Whether day races or big tours, hundreds of thousands of followers flock to the roadside to watch the cyclists ride by. They come so close to their idols that they can almost count the beads of sweat. A must for all cycle fans, this illustrated book is as direct and emotional as a roadside view. It presents each of BORA - hansgrohe's riders up close and through very personal testimonies, including the team's star and one of the most dazzling figures of contemporary cycling: Slovak Peter Sagan. But Sagan's great achievements would not have been possible as a one-man show. In addition to his teammates many others contribute to BORA - hansgrohe's success, from the physiotherapist to the cook. They, too, share their experience from inside this phenomenal team. Stunning race photos capture the riders through all the highs and lows of the sport-the daring departures, the full speed sprints, the falls and injuries, the exhaustion, the throngs of cheering fans-as well as breathtaking locations.